Holiday update: we are going to The Algarve in Portugal at the end of this week! Yeah! So here is dress number two of the holiday wardrobe. This is a digitally printed viscose fabric that I bought online. The viscose is very soft, drapey and lightweight. I decided Vogue 8787, with its cowl neck, would be perfect for this dress. I have made a winter version of this dress before, (check that version out for my review) and I do like to wear my winter version when it is colder. However, it does gape somewhat at the front of the armhole. This time round I pinched out the excess fabric from that region before cutting the bodice out. This did have the overall effect of tightening the bust up slightly, but it is not uncomfortable and the fit around the armhole is much better. But this fit issue is still something I am looking to resolve! The contrast midriff section was cut from a remnant of black eyelet fabric I had lying around, underlined with some lilac linen mix fabric. I also cut a wedge of about 1 1/2 inches off from the bottom of the centre back of the bodice, tapering down to 1/4 inch at the side front. If you compare the back of the winter version with this version you will see the midriff sits straight now, and doesn’t dip down. Oh, I should say that the skirt portion is from Simplicity 1699 (I didn’t have enough fabric/ couldn’t be arsed to cut the 7 pannelled skirt from Vogue 8787). I wish I had cut the skirt front on the fold, but hey ho. 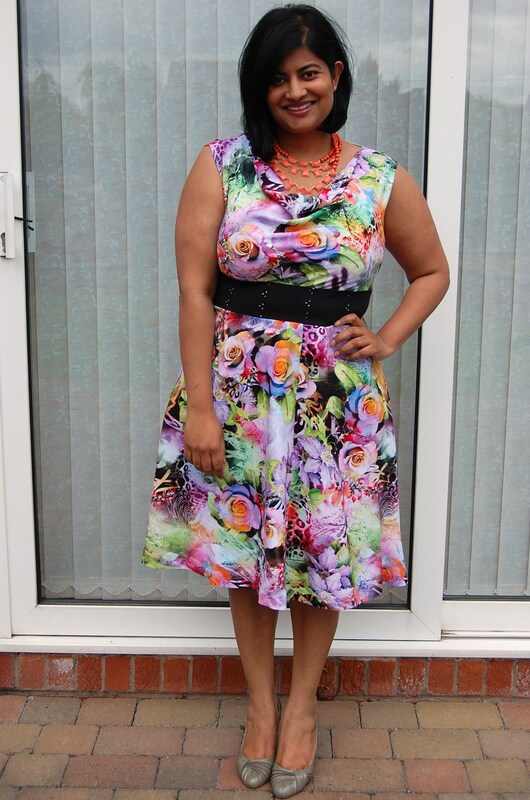 The dress is fully lined with a pongee fabric and I used an invisible zip. Cynthia Rowley Pattern Simplicity 2215: happy fathers day! Very pretty dress. The fabric is just lovely. I hope I don’t come off as mean or negative, but i’m going to tell you something because I know you are a little new to sewing: you have to be careful about the placement of motifs on the bust. I say this from my own bad experiences! Ha Katherine thanks for your comment. I would never have even noticed I don’t think as this fabric is so busy but now you have said it… It is something I will remember for future! What I do is place the pattern piece on my chest and mark where the center of my breasts are so that when I lay my pieces down and I can see where the design is going to hit. I don’t think it is that noticeable in this piece because of the placement of the other flowers, but I always check when my fabric isn’t a solid or small repeating motif, just in case. Thanks for the tip Kimberley! I will say, I love this pattern. I just got a gorgeous piece of fabric in the mail…it’s a beautiful floral border print….I was trying to decide the right pattern and I think this is it. I,too, was worried about it not being enough, but I like the fact that you used a different skirt pattern….So, thanks for sharing! I will be referencing back to this post. Thanks Alethia. Hope your version comes out great. beautiful and great fit. I think this pattern is such a winner. Have fun on your vacation. Your dress is quite lovely and the fabric is eye-catching. Perhaps you might need an FBA (full-bust adjustment) to prevent the gap in the front armholes. I use this adjustment in sleeveless and sleeved garments and the fit is perfect. There are lots of youtube explanations on how to complete an FBA. This dress is simply stunning on you! I have that problem too and what usually fixes it is an adjustment at the shoulder essentially pulling the dress up some. This has worked for a cowl necked dress mostly because there is plenty of room in the bust area with the cowl. Pin the shoulder seams and see if it works. Hope this helps. Forgot to comment on the dress. It’s very pretty. It’s on my list and I hadn’t thought z about a floral before now I think I have just the right one! Thanks!!! Hello I love your dress , what a pretty fabric. I love digital prints. I hope you enjoy wearing it on your holidays. Hello Lisa. Thanks very much!